By the time Shyamoli Panchal returns home each evening she has miraculously mutated from an eight-year old schoolgirl to a knocked-around war veteran. Her knees are bruised and often bleeding, her socks are gathered in an ungainly heap at the bottom of her legs, and her ponytail, neat and shampoo-shining in the morning, is shapeless and wild. Invariably hungry, the first thing she does when her mother greets her at the door is demand food. "Aaje khavama shu che (what's there to eat)? " she asks in Gujarati, the language of her father. And whatever her Bengali mother has made, the little girl is never happy. "Anathi vadhu rasprad biju kayi na hoi shake (couldn't there be anything more interesting)? " she asks. And, adds for dramatic effect. "Hu ketli mehanat karu chu and thame mane aavu aapo cho (I'm studying so hard and this is what you give me)." But Sadanand and Mousami, the tiny tyrant's indulgent parents, don't mind. "She's quite a handful and can make things pretty chaotic around the house, but when she speaks in Gujarati it makes up for everything," Sadanand, a chartered accountant working in Delhi since 2000, says. "Her grandparents, who live in Gujarat, are ecstatic to know that Shyamoli continues to make life miserable for us in the language of her forefathers." Sadanand is lucky he's in a position to joke about it. Countless couples in urban India, troubled by thoughts of seeing their children grow up without an inkling of their mother tongue, don't . "It's awkward when my cousins from Patna come visiting," says Rajeev Singh, a software developer in Delhi. "They speak in Bhojpuri and both my children, 10 and 12, are completely at sea during such conversations. No one likes the situation - not my cousins, nor my kids. And I hate to be in the middle of it all. Everyone looks at me accusingly. The kids wonder why their uncles and aunts make no effort to speak in Hindi or English. My relatives, on the other hand, appear mortified that I have failed in doing even this much - teach my children their mother tongue." It is, and it's getting worse. In an increasingly urbanised India, mother tongues are under siege and facing a sustained attack from the three Ms of migration, market and mixed marriages. What will, for instance, the children of a Kashmiri married to a Tamil with a job in Kolkata pick up? And the battle is looking increasingly lopsided by the day. In every second family - say in Mumbai or Delhi, even Pune or Bangalore - young, upwardly mobile couples are taking recourse to English as a means of communication between themselves and their children. Hindi, too, has gained ground across Indian metros as a major link language - the prime casualty everywhere is the mother tongue. Unesco estimates that as many as 196 Indian languages face varying degrees of peril - some are staring at extinction, others are at risk of losing their literature. Scholars at Tribal Research Institute (TRI), Ranchi, say that at least 25 per cent of tribal youths in urban cities, especially those who have not spent any time in their native place, do not know their mother tongue at all. Another 50 per cent can understand the language but are unable to speak it. Prakash Chandra Oraon, director of TRI, and an expert in the Mundari language, blames government and NGOs for the present crisis. "In six decades of independence, government agencies and NGOs have treated tribals like objects in a museum and have relentlessly worked to take away their culture in the name of assimilation with society," he fumes. "Whenever a tribal is approached for anything, he is told to adapt to the modern world. If this is not stopped, there won't be anybody speaking any tribal language." Oraon would be very unhappy to meet 12-year-old Suman Murmu, who has never heard her parents speak Santhali. "I study in an English medium school and have never heard my parents converse in our mother tongue," she says, a little mystified. "Most of my relatives don't speak Santhali either, so how can you expect me to speak a language that is not known to me?" Suman's father Vishwanath Murmu, a bank employee, says his wife, born and brought up in Orissa, doesn't know Santhali. "For us, the most important thing is communication," he argues. "Most of the people around us in Ranchi speak in Hindi; if we were to speak Santhali, we'd be treated as aliens." 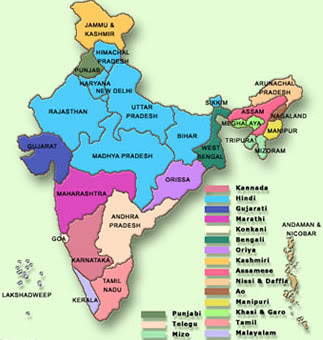 In India - with its burgeoning ambition, changing demographics, widening market, nuclearisation of families and massive shift in population from the rural and semi-rural to the urban - the linguistic map is rapidly changing. For many this change is the inevitable destiny of old languages in a new world. Madhu Singh, the mother of Harshita, a class IV student in Patna, says she doesn't mind the girl not taking a shine to Magahi , their mother tongue. She encourages her daughter to speak English "as one needs to move with the trend instead of trying to persist with something that has little to do with one's career." Somnath and Suman Banerjee, an Army couple in Chandigarh, have also done what numerous young couples across India are doing - gloss over the mother tongue issue. "We decided early on not to force our two kids, Nikhil and Nupur, to learn either Bengali or Punjabi. Of course, we have a mix of customs and traditions at home but when it came to languages it was convenient for everyone to have a 'neutral' language so that the kids could adapt to their cosmopolitan surroundings." The other important reason for parents to let go of their mother tongue is the feeling that their children will fare better if they can speak English and the main language of the place they have settled in. Sanjay Wadwalkar, a professor, never misses any Marathi function that's held at the Maharashtra Bhawan in Chandigarh. But teaching the language to his two sons, Arjun and Abhay , has never been a priority . This is also where the breakdown of joint families kicks in. Devoid of the company of grandparents, children of most urban Indian couples have no link with their native tongue. During the course of this article, as TOI-Crest reporters fanned out across the country's metros, many youngsters said they didn't even know their parents came from diverse cultural and linguistic backgrounds because all of them spoke English at home. The "assimilation" , in that sense, was complete and seamless. It's a pointer to a larger change sweeping across communities migrating from their native towns to urban centres. Like Tamra, the daughter of IAS officers Neerja Rajsekhar and Rajsekhar Vundru, says, "I speak in English or Hindi. The one time I showed an interest to learn Telugu (her father's mother tongue), there was no one to teach me." But what is this doing to the linguistic characteristics of India, and its rich linguistic diversity? With a quarter of India's population - 255 million - speaking at least two languages and one in every 12 - that's 87.5 million - speaking at least three, India is still a nation of polyglots. An analysis of data from the 2001 census on bilingualism and trilingualism suggests that speaking three or more languages is largely restricted to the relatively elite sections of society, but bilingualism is not. The data shows that of the 87.5 million people who speak three or more languages, a little over 63 million speak both Hindi and English. This could be the impact of the three-language formula in schools, but the fact that almost three-fourths of the trilingual population speaks English is evidence of the phenomenon being more common among the better-off sections of society. There appears to be a clear link between knowledge of English and economic prosperity. Among the 167.5 million who speak only two languages, only 54.8 million speak English as either their first or second language. In other words, less than a third of the bilingual population knows English. Quite clearly, many of the bilinguals are from the not-so-well-off sections. The phenomenon is more visible in the south, where the absence of a link language - unlike Hindi in the north - means that outside of the home, conversation amongst friends and colleagues , in relatively affluent quarters, is entirely in English. This is not to say they don't know other languages. Most Kannadigas or Malayalis follow Tamil (it's not necessarily the other way round) but English is the language of choice for conversation. Kids in big, southern city schools are likely to speak different languages at home: Kannada, Tamil, Telugu, Malayalam, Tulu, Kodava, Konkani, Urdu, Deccani. But they can only converse among themselves in English. And because English is the language of the peer group and also the medium of instruction, they tend to think of it as the preferred language. Alice Mathew, a lecturer in Mount Carmel College, initially tried to speak to her son in Malayalam but he wouldn't react. "Even if he tries to speak Malayalam, it's anglicised," she says. "When we visit Kerala, he makes an effort to speak in Malayalam but ends up speaking in English." Her colleague, Lekha George, a botany lecturer, shares the same "problem" . Though she tries her best to speak to her three-year-old old son in Malayalam, her husband and babysitter both speak to him in English. "He has picked up a few words in Malayalam but mostly he speaks English. I am very keen that he learns his mother tongue," she says hopefully. Though most experts and linguists watching the trend agree modern culture, urban living, and the need to earn a livelihood in a competitive world have deprived the youth of their mother tongue, they say it needn't be so. Nor is it necessarily a good thing. "Language is part of a people's culture, so such children do become alienated from their culture in certain ways," says Rajani Konantambigi, associate professor at the Tata Institute of Social Sciences (TISS). TOI's Swaminathan Anklesaria Aiyar in a recent column says, "Global research shows children should learn reading and writing in their mother tongue first. Only after they can read fluently at a minimum of 45-60 words per minute can they absorb what they are reading. Such fluency is most easily achieved in the mother tongue. Once that is established, learning the second language becomes much easier. Premature teaching of a second language - like English - can prevent a child from learning to read fast enough in its mother tongue. Early reading and writing is vital: children that cannot do so fluently by Class 2 will likely never catch up with classmates in higher class. These insights flow from research on the neurological foundations of learning. In Efficient Learning for the Poor: Insights from the Frontier of Cognitive Neuroscience, educationalist Helen Abadzi shows that human short-term memory works well for up to 12 seconds. So, within 12 seconds, a person should be able to read a sentence (or complete grammatical unit), process its meaning, and classify and file it within his or her mental library (what experts call "cognitive networks" )... This is not an argument against learning two or three languages. Indeed, children under eight learn new languages most easily. But research shows that proficiency in one language makes it easier to master a second. Learning the first language expands the cognitive networks of a child's mind, making it easier to grasp the same concepts in a second language." Adds Mohini Khot, head of department of English at St Mira's College, Pune, "English, which is technically not the first language in India, is a matter of prestige for most Indians and parents realise that it's important for their child to know it. But keeping an open mind towards our regional languages is equally important." Orissa takes pride in being the first state in India to be carved out on a linguistic basis in 1936. But for the past 10 years, Naveen Patnaik has held fort as chief minister notwithstanding his welldocumented inadequacies in reading, writing and speaking the state's lingua franca. "That a person in Orissa can have a meteoric political rise like Naveen's without bothering to learn Oriya reflects the gradual indifference among the people to their mother tongue and also their whole-hearted acceptance of the 'other' tongue - English or Hindi," says a senior bureaucrat. Linguists say no one can ignore the pressing need - and the urgency - to learn English as it is the only window to the outside world, a potent weapon that allows one to compete in a marketdriven environment, but so much "dependence" is unnecessary. Co-existence, they say, is the key. Attributing the decline of mother tongue to the impact of globalisation, sociologist Hetukar Jha says, "Homogeneity is the demand of globalisation and things like mother tongue are found to be obstructions in achieving this goal. Parents are putting their mother tongue on the backburner in an effort to make their children more compatible with the needs of current times." Dr G K Karanth of the Institute for Social and Economic Change (ISEC), Bangalore, says a multi-linguistic environment existing alongside the mother tongue is a must for a healthy society. "Mother tongue has to be there," he says. "Without the mother tongue, the whole basket of culture is lost. Cultural moorings are lost when the mother tongue is neglected ." Bernard D'Sami , professor of Social Sciences, Loyola College , Chennai, says "uprooting kids" from their culture can never bear good results. It is this realisation - that a modern India galloping on the strength of English is tearing children away from their languages and roots - that's triggering a modest push-back. Prajodh Rajan's Malayalee maid has a rare purpose. Some years ago, he had hired her at a premium on one condition - she must speak to his son Aarav only in Malayalam. Aarav, who was about a year old then, could understand Gujarati, the language of his mother, and English, but not a word of Malayalam, Rajan's mother tongue. Today, Aarav is capable of at least monosyllabic conversations in Malayalam. For Rajan and a few such parents, the itch to rescue their mother tongue is finally translating into action. While some are sending their kids to schools which have regional languages in the curriculum, others have resolved to speak in their mother tongue at home, even if they speak it badly. Every morning, as Ganesh Kumar sat for breakfast with his family, he faced a peculiar situation. Each member of his family spoke a different language. He spoke Tamil and his wife, Marathi. His convent school-bred daughter preferred English and his 18-year-old son, currently studying in Bangalore, spoke in a language yet to be named though it had traces of English, Hindi, Tamil, Marathi and Kannada. Kumar has now enlisted himself in the struggle to revive the mother tongue. These days his daughter and wife attend tuitions for written Tamil every weekend. There are other young parents who are trying to avoid Kumar's fate. There are online tutorials that they subscribe to - like the one started by Thomas Samuel for children who want to, or are forced to, learn Malayalam. The internet is of immense help and has brought a bunch of children to his site. Recently, a curious eight-year-old logged on and asked why his father's friends called him "kudavayaran" (pot-bellied ). Pankaj Shah, the head of Kutch Yuvak Sangh, says many concerned parents ask him to involve their children in the annual Kutchi dramas organised by him. The parents are militantly protective of Kutchi. "Once, when we tried to use some English sentences in the dialogues for impact, parents objected saying the aim was to teach Kutchi. We had to alter it," says Shah. It's an obsession that also drives Delhi-based musicians Shubhendra, a Kannadiga, and his Dutch wife Saskia. "We wanted our son Ishaan to speak both languages," Shubhendra says. "He is almost five now and he knows five languages -Kannada , Dutch, English, Hindi and even Bengali, as we live in a Bengali colony. We are very proud and happy that he is culturally more open and tolerant than many others his age." Will people like Shubhendra, Rajan and Kumar succeed in turning the tide for India's embattled mother tongues? No one quite knows. But there is hope. "I know only a few words in Garhwali, 'yu bhalu chhah' (it's good) and 'thikai chhah' (everything is alright)," says 22-year-old Krinna Dobhal, an IT professional who's guilty of abandoning the language of her ancestors. "I'll learn more." Pledging to do it soon, she agrees with Karanth that without the mother tongue, a whole basket of culture is lost - including your roots. "English is necessary for knowledge and career advancement," she says. "But it shouldn't be at the cost of the mother tongue." Anand Soondas -With reports from Devparna Acharya, Swati Shinde, Shruthi Balakrishna, Bella Jaisinghani, Sandeep Mishra, Sharmila Ganeshan-Ram, Sanjay Ojha, Sanjeev K Verma, Ramaninder K Bhatia, Jaspreet Nijher and Shimona Kanwar.